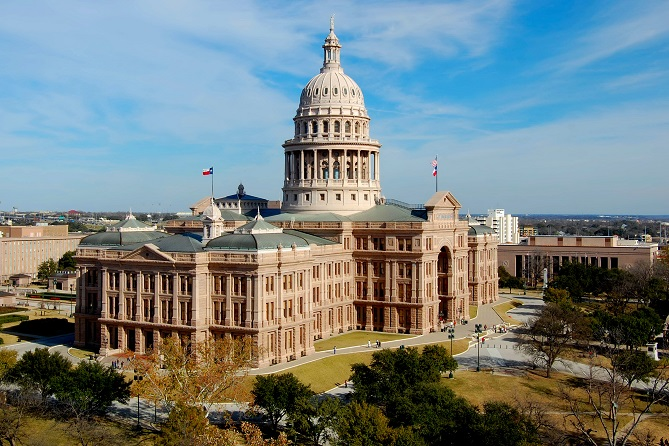 Did you know that the Texas State Capitol building is taller than the US Capitol building? Texans generally love to boast that everything is ‘bigger and better’ in Texas. Sometimes this is just eager pride and sometimes it’s truly fact as it is in the State of Texas Capitol building. Situated near downtown Austin, at 302.64 feet, it is almost 15 feet taller than the 288-foot-high U.S. Capitol. Surveyors using high-tech equipment measured the domed pink-granite building and found the long touted status of being higher than the nation’s capital to be true. Built in 1888, during its construction it was billed to be the Seventh Largest Building in the World. The builders of the capitol, known as the Capitol Syndicate, were paid with more than three-million acres of public land in the panhandle of Texas, which later became the largest cattle ranch in the world known as the XIT Ranch.. It was constructed largely by convicts and migrant workers, up to as many as a thousand at a time. The building has been renovated several times, with central air conditioning being installed in the 1950’s. Another round of refurbishments was completed in 1997. We hope you enjoyed reading the list above about the most interesting facts about Texas. If you have any additions to my list or just want to put in your two cents worth, just click here My 2 cents.